You asked for it… I think I’ll upgrade my pledge now. kbye. Is the new watch worth it? Well, it certainly looks much nicer. Not quite as bright, but the thinner more ergonomic look is a big step up. The fancy new OS could be a hit or a miss, and the colour e-paper is nice but not necessary. It’s water resistant, but I can’t find out if it is rated as well as the original Pebble (a feature I’d be loath to lose.) It’s also a bit more expensive this time around. Look, if you ALREADY have a Pebble, I’m not sure you’d need to dive in again (having said that, if their last campaign is anything to go by and with the ridiculous popularity of the current one, your current watch may very well have expired by the time the new one is sent) but if you have not yet taken the plunge, I can STRONGLY recommend you get in on this new campaign. Pebble Watch. Long Wait. Worthwhile Smart-Accessory. 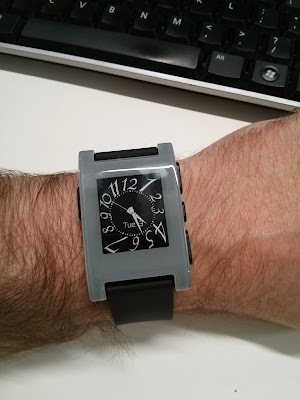 I missed out on backing the Pebble Watch’s 10-million dollar kickstarter. They were the record-holder and poster-child for kickstarter for quite some time. It is a little disingenuous, I think, to call the Pebble Watch a “smart-watch.” By itself, it only tells the time: not too smart. It’s more like a “pager for your phone.” Basically it connects to your phone via bluetooth and calls and messages that come in pop up on your watch. Out of the box it’s just SMS, Calls, E-mails, and Facebook. All I wanted the pebble to do is to flash up notifications so I could quickly absorb the information and then move on without having to pull my phone out. Sure, if it’s something I need to action, then I’ll fumble with my phone, but a good percentage of my phone’s bleeps and bloops throughout the day are merely informational. My second goal was to leave my phone on silent. 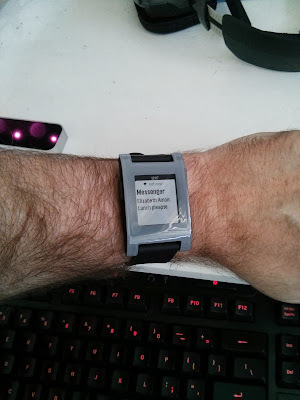 The Pebble vibrates with incoming notifications, so it makes nary a peep, but there’s no way I’d miss one. With all messages coming directly to my wrist, there is little need to have my phone make any sound at all. I had quite cool Tasker profiles set up to change my volume depending on where I was – and it would still sometimes be too loud, or I’d miss a call. Neither of those should be an issue any more. Well, now it has arrived – does it live up to my requirements? Yes. Absolutely. 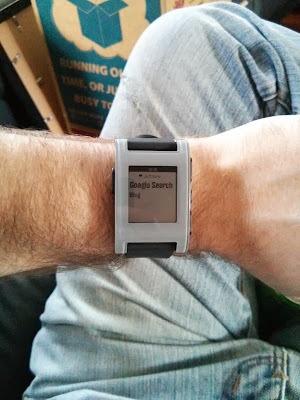 Not straight out of the box… but it only took downloading one little app called “Pebble Notifier” which pipes all of your notifications to your wrist (with customisation possible to exclude ones you really don’t need.) It never misses a beat; it is subtle and effective. It’s the little things, I suppose, but it’s working a treat. It works with iOS as well, but I don’t know how well. I know it does the basics fine, but I believe it struggles with things that have been brought to the Android platform with Pebble Notifier. It comes in 5 colours. You can change the watch face to suit your need. There’s quite a lot to choose from at http://www.mypebblefaces.com/ or you can generate your own. Although the phone is not that smart, you can install apps to it. These tend to be watch-centric apps such as a stopwatch, a new alarm system, a new music controller, etc. The Pebble App on your phone painlessly pushes these apps and watchfaces to your wrist in seconds. Oh, yes, did I mention you can control your music from your wrist? You can see what’s playing too. So. Not much to complain about, except how long it takes to get the damn thing. If you live in America, you can pick one up from BestBuy (you bastards.) Everyone else is looking at a couple months wait. As time went by, though, I became less-impressed with the look. Now it is here, I find it errs on the side of kinda-ugly. It’s extremely light, especially since I replaced a metal watch for it, which makes it feel flimsy. It also looks like it’s made from plastic… which, to be fair, it totally is. 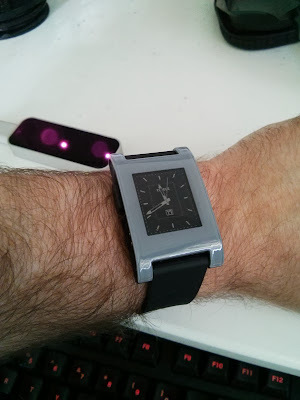 The wristband is also a stiff plastic-looking rubber (but is extremely comfortable.) I think the whole look could be greatly improved by swapping the wristband. Look, I’m not embarrassed to wear it, but I’m also not going out of my way to show it off. Considering what a cool little package it is, it takes some effort to convince people to check it out, because at first glance you might be forgiven for thinking it was a $7 watch I grabbed at a service station.